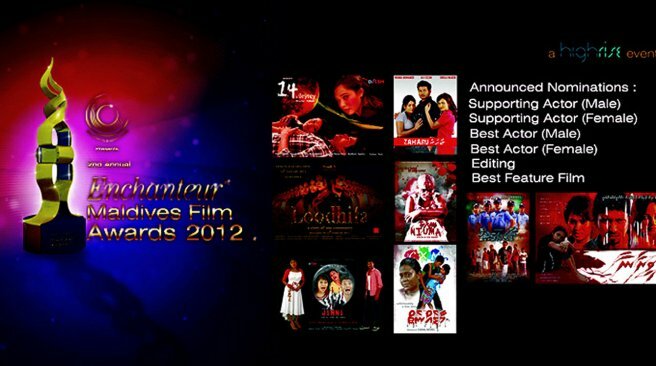 It was announced that Mumin Fuad’s “Loodhifa” leads in almost all the 7 categories dedicated to the feature films. The film which comes with the acting of up-rising stars in the Maldives film industry had been in the list for the nominees for the best feature film, best actor (male and female), best director, best supporting actor (male and female) and best editing. Along with “Loodhifa”, it is seen that “jinni” is lined up in the nominees for the best feature film beside “Insaaf”, “Maafeh neiy” and big money movie “Niuma” by Dhekedhekeves Productions. Ismail Rasheed (Kopy Isse) from “loodhifa” competes in the nominees for the best male actor along with Ahmed Nimal from “Niuma”, Ali Seezan from “Jinni”, Ahmed Saeed from “Insaaf” and Yoosuf Shafeeu (Euppe’) from “Veeraana”. Mariyam Afeefa had been nominated for the best female actor from the film “Loodhifa” and “Jinni” while Niuma Mohamed nominated for this category from “Niuma” and “Maafeh neiy” and Fathimath Azifa from the movie “Loodhifa”. Important categories such as nominees for the best director and best screenplay have not been announced last Tuesday night. Sheela Najeeb leads in the list of nominees for the best supporting actor (female) from the movies “Niuma” and “Zaharu”. Producer of “Dhekedhekeves”, Mohamed Abdulla (Muhamma) is in no doubt to win the best short film category of which all the 3 nominees are his; “Farihibe 3”, Siyaasee Vaccine” and “Muhammaa ge’ briefcase”. “Maldives Film Awards” is an award introduced by “Maldives Film Association” which is a private organization of the Maldivian Film Industry. The award show will be held at “Dharubaaruge” in the upcoming week, July the 3rd. All the unannounced nominees of other categories will be known by that night.